figurative language, and really just whatever is pertinent during that time (i.e., holidays). I recently decided to make a quick social language activity because I had some leftover paper, and we were working on the emotion "frustrated" anyways lol. It turned into a monthly activity when I realized I had some space on my bulletin board in my little corner, and it was bothering me. Voila, emotion of the month was born and added into my warm up! I created a 12-page packet to target basic emotions. 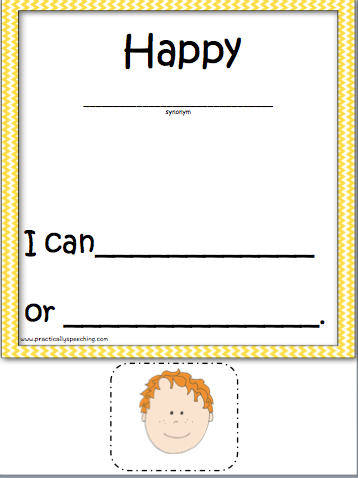 I included "I can" statements to teach students ways to cope with a negative emotion, or display a positive one. It's also a great way to identify emotions in other people. The packet I created is meant to be laminated and use with dry-erase markers, as well as a little velcro to attach the photo included. You could also have students draw their own pictures. 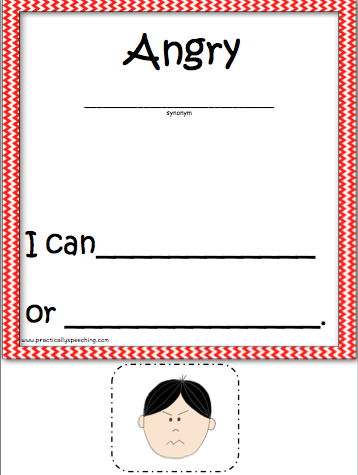 Another idea if you're not going to use it monthly, is to hole punch the top and use it as an emotions workbook!